The Octopus is the boss of the Turtle Zone in Super Mario Land 2: 6 Golden Coins, in the belly of a giant whale. 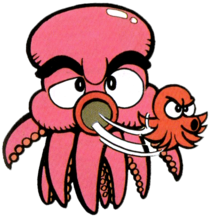 The octopus will attack Mario by swimming around releasing its offspring, known as Poko. The little ones will home in on Mario, while the parent swims left and right across the arena. In order to defeat the octopus, Mario had to hit its head three times, which can be difficult as the entire battle with the octopus takes place underwater. Alternatively, Fire Mario can defeat the octopus with six fireballs. The smaller octopodes cannot be harmed, and are the most dangerous threat in the battle. The octopus also appears in the Mario vs. Wario comic, which is a (loose) adaptation of Super Mario Land 2: 6 Golden Coins. It attempts to attack Mario while he is crossing a lake, but is stopped when Mario asks what an octopus, a saltwater creature, is doing in a freshwater lake. The octopus ponders this and then exclaims that must be why it hasn't been feeling good. Mario offers to pour some salt in the water for the octopus, but accidentally pours sugar instead. It is last seen lying face down in the water, unmoving. Pako Play on the word 「タコ」 tako, meaning "octopus". This page was last edited on March 24, 2019, at 02:44.